Why visit Washburn Point? If you're driving down Glacier Point Road for the first time, it'll be at Washburn Point where you'll round the corner and catch your first glimpse of the great vistas to Half Dome. It's an unforgettable moment, and your eyes might leap out of your head and abandon you forever if you don't stop to let them soak things in for a minute or two. Crowd Factor: Medium to high. Lots of people stop here on their way to Glacier Point. Scenery Factor: The views here are similar to the views at Glacier Point, but from a more southerly perspective. You won't be able to see Yosemite Falls from here, and you'll see Half Dome edge-on instead of seeing its face. You will have a better view of Illilouette Falls here - and if you brought binoculars, it's probably a better view than you'll get from the Illilouette Falls trail itself. Difficulty: There is no easier hike in Yosemite. It's only by stretching the definition of "hike" to its absolute limits (OK, beyond its absolute limits) that this can be called a hike at all, since it consists of parking and then descending a staircase. Best Time to Visit: Whenever Glacier Point Road is open, you'll find a stop here rewarding. It might be elevated a little more in the spring, when you can look across the canyon to see (and hear) Vernal, Nevada, and Illilouette Falls at their peaks. Nearest Bathrooms: at Glacier Point, the road's terminus, less than a mile farther down the road. Nearest Snacks: also at Glacier Point. Driving Directions: From the South entrance to Yosemite, turn north (left) and proceed 17.3 miles (27.7 km) to Glacier Point Road. From the valley, take road 41 nine miles (14.5 km) to the same road. 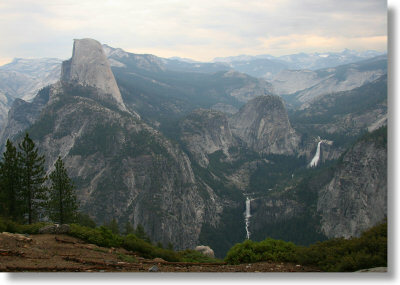 Once you're on Glacier Point Road, follow it to the trailhead 15 miles (24 km) down the road. Here's a Google Street View panorama of the point. Parking: A lot at the trailhead holds about three dozen cars. Already been to Washburn Point? Add a Review.